The toothbrush handle is tapered, making it easier to grasp, and features a non-slip soft grip to keep the brush from crashing to the floor during use. It’s smaller and lighter than the old Sonicare Elite and Sonicare claims it uses 80% less vibration to achieve better results. Like the HealthyWhite 710, it uses an Li-Ion battery. Li-Ion batteries mean lighter toothbrushes and improved battery life. 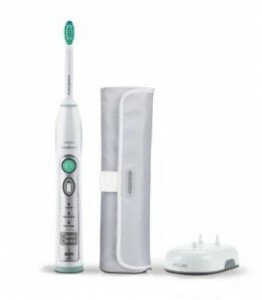 Sonicare estimates the Flexcare R910 should last up to two weeks between charges. If you’re wondering how much power you have left, a display built into the handle will let you know. Pictured: A deluxe recharge gauge. In a hurry? The “GoCare” routine runs for a brisk one minute to let you freshen up between brushes. 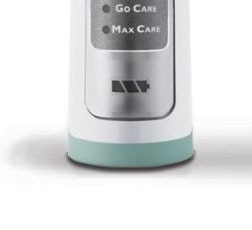 If you’re looking for a more thorough clean than the usual two minutes will allow, “MaxCare” runs three minutes — two minutes of “Clean” mode, with an extra minute of “Massage” tacked on for good measure. Like most other Sonicare models, the Flexcare R910 uses Quadpacer technology to break up your brushing session into 30 second increments. In addition to letting you set the length of your brushing session, the Flexcare R910 comes pre-programmed with three settings to let you control the strength of the brush’s vibration. “Clean” is your everyday, run-of-the-mill cleaning option. Unsurprisingly, however much online reviewers seem to love this brush, the majority of them seem to use the “Clean” setting exclusively. 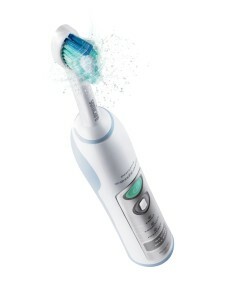 The brush also provides a “Sensitive” mode for areas that need a gentler touch and a “Massage” mode for use on the gums. Flexcare R910 or Flexcare RS930? The RS930 and its accompanying UV Brush Head Sanitizer. Unlike the HealthyWhite 710 and its sister, the HealthyWhite R732, which at least had one significant difference between them, the Flexcare R910 and the Flexcare RS930 are identical. The toothbrushes themselves are exactly the same. So what’s the difference? In addition to the R910’s slate of accessories, the RS930 comes with an extra brush head, a UV Brush Head Sanitizer and a travel charger. And yet the RS930 is popular, even moreso than the R910. It’s got a slightly lower rating on Amazon.com (4.2 out of 5 stars as of this writing, compared to the R910’s 4.3 out of 5 stars), but has chalked up 270 more reviews. Read the customer reviews for yourself at Amazon.com. check out the Flexcare RS930’s Amazon.com product page. The more expensive these toothbrushes get, the more you’re going to hear me hammer on about keeping your receipts. The Flexcare R910 comes with a two year warranty from Sonicare and, assuming the brush dies before the end of the warranty period, the company is actually pretty good about providing replacement units. Be aware, though, that your two year warranty runs from the original date of purchase. If your replacement unit breaks down outside of that initial two year window, you’re (unfortunately) on your own. One of the most common complaints I see about this model is the location of the setting control buttons. As you can see in the photograph above, they’ve been built into the middle of the handle. The design gives the brush an attractive, balanced look, but frequently means users accidentally change the speed mid-brush or even turn off the unit altogether. In the year I’ve owned this model I’ve never had a problem with the controls during use, but then I have small hands. The ProResults brush head design solves a lot of problems. Unlike the “screw-on” design used in older models, the ProResults brush head snaps easily into place, leaving fewer places where mould and bacteria can fester. However, some users have reported durability issues. Some customer reviews have described replacement brush heads shaking themselves loose. If you’re one of the unlucky few affected by this problem, it can make replacing your brush heads every few months an exercise in frustration. Don’t drop it. No, seriously. Don’t. The metal shaft that makes the Flexcare R910 vibrate is very, very fragile when in use. When turned on, the shaft under a ridiculous amount of stress. Dropping the unit can break it. By some accounts, such as this interesting thread at Instructables.com on the subject, even run-of-the-mill metal fatigue can be the culprit. The Instructables.com link isn’t for the DIY-faint of heart. Remember, any impromptu electric toothbrush surgery will void your warranty. As of this writing, Amazon.com’s customer rating for this toothbrush is 4.2 out of 5 stars. The Flexcare R910 is a great choice for people who like choices, but for those who prefer routine its extra modes and settings will likely not see much use. Before shelling out the extra money, think about how you’re going to use your toothbrush. If fewer options and a cheaper price tag seems more your speed, my review of the EasyClean is over here. If you do decide to buy this product on Amazon.com it’s important to understand what “Amazon Frustration-Free” packaging means. 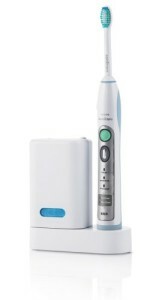 You will receive your Sonicare Flexcare R910 in a cardboard Amazon box, with none of the original packaging. This makes it considerably easier to open (and recyclable), but much harder to wrap. If you’re buying this toothbrush as a gift, be sure to select the “Retail” option instead.